In a previous post, “Enhancing DAQ performance for grid protection, control and monitoring equipment using DC/DC power modules,” we discussed how power modules offer lower electromagnetic interference (EMI) and output ripple, thus improving overall data acquisition (DAQ) performance. In this post, my colleague Sreenivasa and I will cover some of the other ways that power modules help improve DAQ performance compared to discrete power solutions. It is not uncommon to see multiple supply rails and varying load current (and ripple) requirements across subsystems in a DAQ. Figure 1 showcases the power architecture for a DAQ system and how power modules generate the required supply rails for various subsystems. Output current in the same package provides design flexibility and scalability with optimized cost. A provision to improve light load efficiency with auto pulse frequency modulation (PFM) mode. Excellent transient response during load regulation. A compact solution through integration, innovative packaging and assembly. Improved power-module performance from careful passive component selection. Operation over a wide temperature range. As explained in the previous blog post, in addition to package selection and a layout designed to mitigate EMI and output ripple, choosing passive components is equally important. Improperly sourced components might function well during the prototype phase, but will show signs of stress and result in damage or failure in the field. The inductor is one of the key components in a DC/DC buck converter design. Choosing the right inductor requires time and know-how, including an understanding of subtle parameters of the inductor core and its impact on power-supply performance and longevity. One of the common issues with inductors is failure during the high-temperature storage (HTS) test, which demonstrates the inductor’s ability to withstand elevated temperatures for prolonged periods of time. During the HTS test, inductors are placed close to the DC/DC converter, limiting airflow. The coating and/or binders of the iron powder begin to break down over time and in high-temperature conditions, which causes increased core loss and reduces power-supply efficiency. The problem is most evident at higher input voltages and higher switching frequencies. Figure 2 compares the efficiency degradation for an inductor over multiple input voltages before and after the HTS stress test. Upon inspection, the inductor doesn’t normally look visibly damaged. The L and DCR values of the inductor may not change. However, exposure to high temperatures increases the AC impedance, as shown in Figure 2. Meanwhile, TI’s power modules integrate inductors that have excellent performance over time and with temperature increases. Figure 3 shows HTS test results for various inductors after exposure to high temperatures. Our power modules use inductors with minimal or no change in Q and core resistance after HTS tests. Also, our power modules undergo testing for working voltages to ensure that there is no insulation breakdown. Power modules provide a MODE/SYNC option, enabling a transition to an automatic power-savings mode at light loads. During normal operation, the power module regulates the output using pulse width modulation (PWM). When the load current is very low, the control logic transitions to PFM operation and diode emulation. In this mode, the high side metal-oxide semiconductor field-effect transistor (MOSFET) turns on for one or more pulses to provide energy to the load. The on-time of the high-side MOSFET depends on the input voltage level and a pre-programmed internal current level (IPEAK-MIN). The higher the input voltage, the shorter is the on-time. The duration of the off-time also depends on the load current level. A lighter load results in a longer off-time. This mode of operation results in excellent conversion efficiency at very light loads. When using auto-PFM mode, the output voltage at no load is approximately 1% higher than forced pulse width modulation (FPWM) operation. Figure 4 shows the efficiency graph for PFM and FPWM modes. Load transient response is a measure of how well a supply copes with sudden changes in current demand or how well the supply follows changes in the load impedance. Load transient response is an increasingly important performance parameter, especially for a microprocessor or a field-programmable gate array that is characterized by a low core voltage, high current draw and fast load switching. Figure 4 shows the load transient response for a power module. You can improve transient response by adjusting the output capacitance, provided that you maintain sufficiently low equivalent series resistance. Adding input capacitance can enhance response for longer and/or deeper transient steps. Adding converter phases also improves transient response by increasing the effective switching frequency and by allowing smaller output inductors and capacitors, owing to the reduction in current per phase. Innovative packaging technologies for power modules have been developed to make them compact. One such packaging technology is the quad flat no-lead (QFN) package as shown in Figure 5, with a single copper leadframe. The integrated circuit (IC) with bypass components is mounted on this leadframe. By mounting the inductor over the IC and passives, the switching node is also compact, short and reduces EMI. Examples include TI’s LMZM33603 and LMZM33602, which both have a 36-V input rating and can deliver up to 3 A of load current. Our MicroSiP™ or QFN packaging technology can be used for rails requiring lower power. This packaging technology uses the bare DC/DC regulator die and embeds it in a thin printed circuit board substrate. Instead of using bond wires, the copper traces connect the die to the substrate, also shown in Figure 5. Examples include TI’s LMZM23601 and LMZM23600, which have the input bypass capacitor and inductor integrated in order to provide improved EMI performance. One of the benefits of power modules is their high-temperature operation. 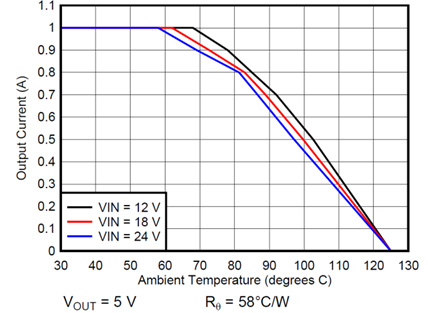 With optimized design, packaging, layout and proper selection of components, power modules can provide 50% load current even at elevated temperatures at 100°C, as shown in Figure 6. In a DAQ, the ADC chosen for sampling AC analog inputs are specified for an input range of ±10.24 V. The AC current or voltage outputs from the sensors are scaled to the ADC input range using gain amplifiers, and the op amps used for scaling the gain are powered using a ±12-V DC power supply. The required bipolar DC supply can be generated using multiple approaches. One such approach is to generate the negative supply by using power modules in an inverted buck-boost configuration. In a standard buck configuration, the positive connection (VOUT) is connected to the internal inductor and the return is connected to system ground. In the inverted buck-boost configuration, system ground is connected to VOUT and the return is now the negative output. This shift in topology enables an inverted output voltage, as shown in Figure 7. In addition to providing the multiple benefits detailed above, power modules in DAQ applications improve system performance and reliability, reduce design efforts, and help designers optimize board space. TI has a pin-compatible family of power modules with varying load currents and programmable output voltages to provide scalability for DAQ designs.